Stop! Are You Throwing Away the Best Part of Jackfruit? Ah, yes, jackfruit: The vegetarian meat stand-in/spiky-looking brown orb the size of a child/behemoth of a thing to breakdown (see here). Of course, you can buy jackfruit canned or packaged with (almost) all the prep work done for you sans seasoning and sautéing, stir-frying, or simmering. While these are surely easier options, wrestling with a 20- to 80-pound jackfruit does have its advantages—namely, the seeds. DON'T THROW AWAY THOSE JACKFRUIT SEEDS!!! As Charisse❤️Cooking says above, take the seeds, boil them for about 10 minutes until they're fork tender, let cool, then dip in salt to enhance their "sweetish flavor." It’s kind of like roasted chickpeas—except less crunch, even more economical and waste-free, and just as addictive. We imagine adding them to salads, snack mix, and eating them by the handful, just as they are. Have you ever cooked with jackfruit seeds? Let us know in the comments below! Haven't had Jackfruit seed in a while, but we also boiled them. Reminds of chestnuts (texture and a little bit of the flavor). 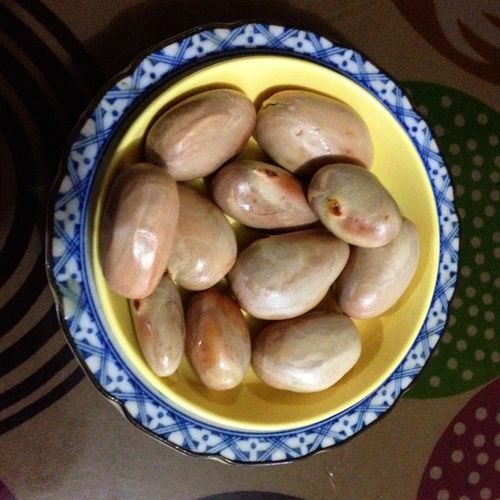 We also boiled durian seeds for snacks. Jackfruit is extremely popular in the South-Western Coast of India particularly in Goa, Mangalore and Kerala..We first wash the seeds and once they're completely dry use them in many coconut-based curries (tastes great with black-eyed peas or prawns) as they have a great chestnutty flavour. But my all-time fave is simply roasting them over coal and seasoning with salt. Add them to lentils and rice - YUM! Always. Given its such a major project to prep the jackfruit arils, its downright criminal to let these go waste! you can either roast them like chestnuts, or boil them and make a stew. They are very starchy - so yes you can boil them. But like a chestnut, I prefer to roast them.